The funeral was held on Tuesday, 7 October 2008 of John Summers at Swansea Crematorium. It was a sad occasion, obviously, but also a real honour and pleasure to meet many of John’s friends and family, almost all of them for the first time. He was a very special man and will be much missed. As one of those readers, I do indeed feel the need to fight for and protect John’s work. The Raging Summer is out of print at present (though copies can be found at abebooks.co.uk), but a couple of years back, when John was in hospital, I promised him that it would one day be republished. I intend to honour that promise. ...is a writer living in London. 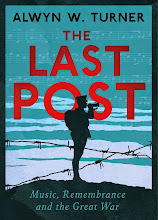 His next book will be The Last Post: Music, Remembrance and the Great War. Previous work includes a trilogy on modern British history: Crisis? What Crisis?, Rejoice! Rejoice! and A Classless Society, and some stuff about popular culture in Britain: The Biba Experience, Halfway to Paradise, Glam Rock, Portmeirion and The Man Who Invented the Daleks. That sort of thing.